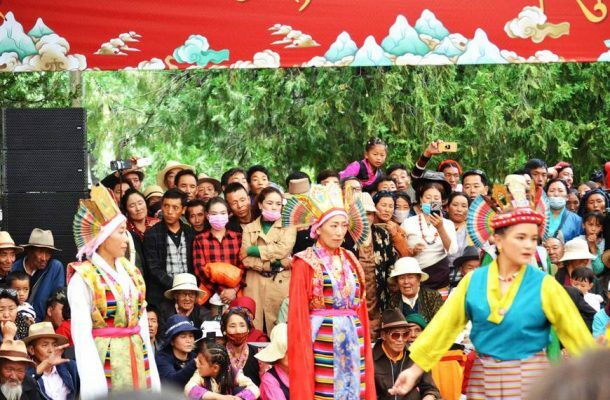 A week-long festival held all across Tibet. The Shoton Festival is one of the most important festivals in the Tibetan calendar. The celebration starts at the end of the 100-day meditation period of the Tibetan Buddhist monks. 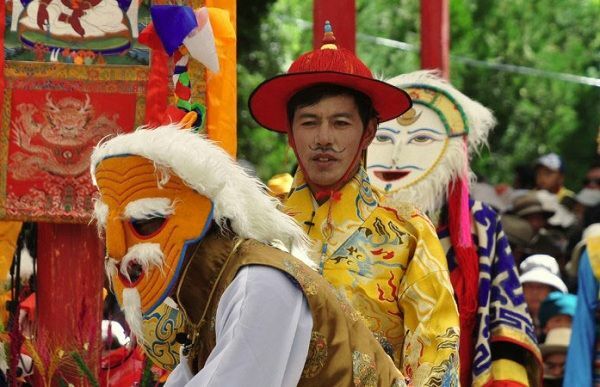 Usually held in the month of August in the Gregorian calendar, since its inception in the 16th century, the festival has changed to include many festivities and games, as well as showings of classic Tibetan operas. Shoton is a Tibetan word, where “sho” means yogurt and “ton” means banquet, making the Shoton Festival also the Banquet of Yogurt, also known as the Yogurt Festival. Starting usually on the last day of the sixth month in the Tibetan calendar. The festival lasts for several days, and can even last up to a week. While yogurt is one of the staple foods of Tibet, it does not originate there and is believed to have come from ancient Mesopotamia in around 5,000 BC. Evidence has shown that yogurt existed in turkey in around 3,000 BC. It came to Tibet in around 500 BC via India, who learned of it from the Turkish traders that plied the ancient trade routes that existed before the Silk Road came into being. Tibet Opera show for the public through one week of Shoton Festival. Yogurt has been a part of the traditional Tibetan diet for more than two thousand years and is not just used for food. In past times, young Tibetan women would spread the yogurt on their faces as a form of a healthy face mask. Similar to the modern acne peel face masks used by women today. Once the yogurt hardened and turned black, usually after 2-3 days, they would peel it off to reveal softer, clearer skin and red, rosy cheeks. Originating more than five centuries ago, the Shoton Festival began with the insistence of the senior lamas of the Gelug School of Tibetan Buddhism that their monks. The lamas would spend one hundred days in meditation inside their monasteries. To avoid killing any small creatures that crawled on the ground when they walked around. At the end of the 100 days, the people of the villages around the monasteries began to hold a banquet for the monks. As thanks for their sacrifice, greeting them as they came out of the monasteries once more. The banquet would prominently feature milk curds, a delicacy of the time. It was easily made from the yak’s milk that was freely available at the time. Later on, the addition of Tibetan operas became a permanent feature of the festival. Mainly because of the thousands of people that would flock to the major monasteries for the yogurt giving. The operas, or Lhamo, would feature many of the classic tales of Tibetan Buddhism and the ancient Tibetan heroes. As time passed, the milk curds slowly became yogurt, which has continued to this day. The modern festivities also include a thangka unveiling at many monasteries, as well as dancing, singing, and games. The Shoton Festival, also known as the Yogurt Festival in many places, is held all over Tibet and can be seen around almost every monastery in the region. However, there are certain places where the festivities are larger with more revelries than others. 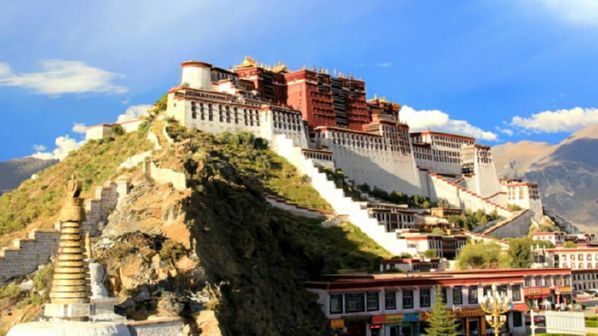 These are well worth visiting while you are in Tibet. At Drepung Monastery, a giant Thangka painting is unveiled on the hill behind the monastery on the first day of the festival. As the horn of the monastery sounds, 100 lamas carry the thangka out onto the hillside and place it on the frame that stands ready for it. As unrolling it slowly so as not to damage this ancient and delicate artifact. The thangka is kept in the Coqen Hall of the monastery and portrays the image of the Maitreya Buddha. The future Buddha that will come as the last Buddha on earth. Mulberry smoke arises from all around the hillside, and the lamas begin chanting the scriptures as the people pray at the thangka. Touching its hem and throwing Khada, the white silk scarves, onto the painting. After around 2 hours, the thangka is rolled up and removed back to the monastery for another year. As the thangka unveiling ends in Drepung Monastery, other major sites prepare for the second day of the festival, with the main one being at Norbulingka Palace in Lhasa. With its massive park and huge grounds. It is the ideal place to hold the Tibetan operas and festivities of the Shoton Festival. Operas are performed daily for the rest of the festival period in the park at Norbulingka, from around 11:00 in the morning until dusk. Yogurt is still the main food of the festival. Every household had brought yogurt and have it in the park. The park at Norbulingka becomes a small cityscape of colorful tents and awnings. As whole families, from the youngest to the oldest, gather to celebrate the emergence of the monks from their fasting. The Potala Palace has a park nearby. It is for the revelries of the Shoton Festival. The traditional Tibetan operas performed throughout the day. The people playing games, dancing, and singing for several days throughout the festival period. The Tibetan operas that are shown. However, there are shortened versions of the originals. There is a limited time frame for each opera school to give their performances. Many different schools of Tibetan opera, performing in competition with each other. 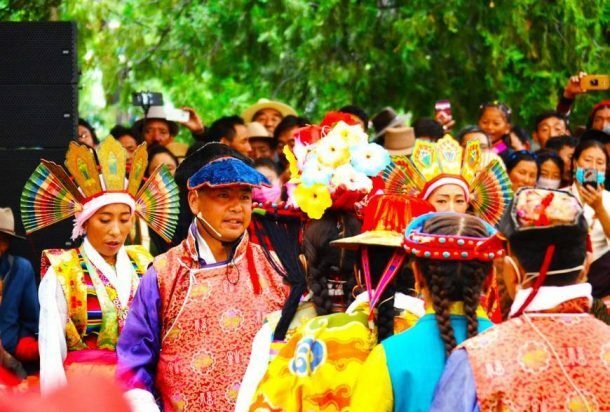 Schools even travel from the provinces of Qinghai, Gansu, Sichuan, and Yunnan to perform at the Shoton Festival in either the Potala Palace or Norbulingka as a matter of Tibetan pride. 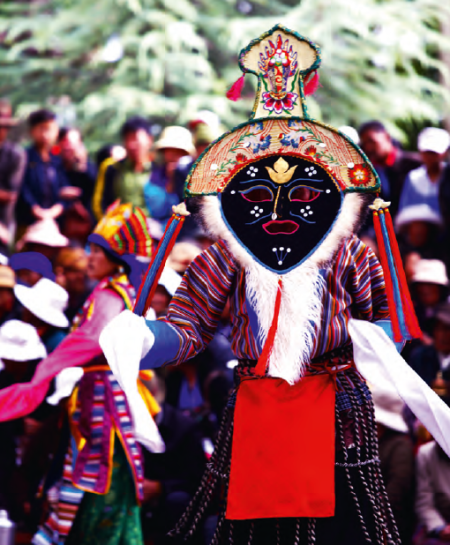 Tibetan operas are, traditionally, very long and drawn out. With plenty of colorful costumes and stupendous masks, dancing and leaping around the stage, and crowd interaction. Known as Lhamo, or Ache Lhamo, these ancient performances of music and dance have been part of the Tibetan culture for centuries. While they are not technically operas, that is the closest western equivalent, and the name has stuck.